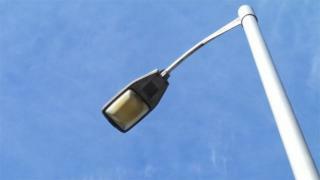 Street lights in residential areas of Monmouthshire will be switched off to save money. The lights will be turned off between midnight and 06:00 BST from 28 October. Monmouthshire council's funding from the Welsh Government has been cut by 1% to £93m, which they say is the joint biggest cut to a Welsh council. Cabinet member councillor Bryan Jones said he understood concerns but said he was "confident" all had been done "to minimise the impact". Monmouthshire council leader Peter Fox said their funding reduction from the Welsh Government is a "3.7% real term reduction in funding" because of a 2.7% inflation rate.